Today I found out, before becoming one of the world’s most famous TV chefs, Julia Child was a top secret research assistant for the Office of Strategic Services, the predecessor of the CIA. 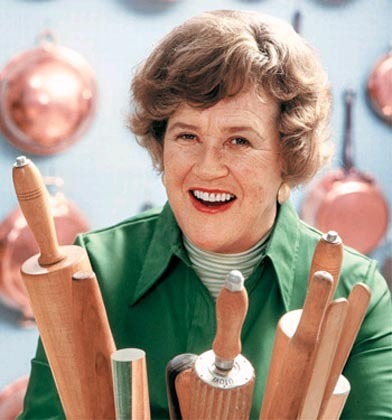 After graduating from college with a degree in English, Julia Child, then named Julia McWilliams, worked in the advertising department for W. & J. Sloane in New York City as a clerk. She later moved to California and continued to work in advertising in more or less the same position. When the U.S. entered WWII, Child tried to volunteer for the Navy’s Women Accepted for Volunteer Emergency Service (WAVES), but was rejected due to her height (6 feet 2 inches, which was 2 inches above the maximum for WAVES). This turned out to be a good thing as, had she been accepted to WAVES, she never would have met her husband who got her interested in cooking and was her first teacher in the culinary arts. Rather, she eventually found her way to the Office of Strategic Services (OSS) under General William J. Donovan. She began there as a low level clerk and, within a year, had risen to senior clerk before volunteering with the Emergency Rescue Equipment department of the OSS as a research assistant, where she worked on such projects as research into whether soldiers lost at sea could survive on drinking liquids from a fish’s body, which Child referred to as “the fish-squeezing unit”. On a similar vein, the navy was having trouble with sharks eating soldiers from downed ships before rescue operations could be carried out. Child was then on a team assigned to come up with a shark repellant, which they did. Near the end of the war, Child was targeted to actually become a spy herself, as she had a particularly adventurous spirit and had proven herself exceptionally trustworthy. But before she could be used as such, the war ended abruptly, shortly after the dropping of the nuclear bombs on Hiroshima and Nagasaki. Interestingly, before getting married, Child was a very poor cook, having lived most of her life with a cook at her home. As she described it, back then, you didn’t need a lot of money to afford a maid and a cook as you could just hire an immigrant for a small amount of pay and room and board. So most middle class and above households had their own maid and cook. It wasn’t until she and her husband Paul, a noted connoisseur of fine foods and also a member of the O.S.S., where the two met, moved to Paris after WWII that she became interested in cooking and began attempting to learn. According to Child, many of her early attempts ended disastrously. Despite her early failures, her husband, an accomplished cook himself at the time, began teaching her to cook and to appreciate fine French cuisine. She eventually enrolled in the famed Cordon Bleu cooking school where her skills started to blossom and she began to master the trade that would eventually make her famous. There were other famous individuals among the other 24,000 or so members of the OSS, these include: Supreme Court Justice Arthur Goldberg; Chicago White Sox catcher Moe Berg; Pulitzer Prize winner, historian, and special assistant to President Kennedy Arthur Schlesinger Jr.; actor Sterling Hayden, who, among other things, was in The Godfather; John Hemmingway, son of Ernest Hemingway; Quentin and Kermit Roosevelt, sons of President Theodore Roosevelt; and journalist and one time co-host of CNN’s crossfire, Thomas Braden, among others. The White Sox catcher Moe Berg was originally recruited to the OSS due to his ability to speak multiple languages with little to no accent. Among the languages he spoke were: German, Italian, French, Spanish, Japanese, Greek, Russian, Hebrew, and Latin. Berg was often parachuted behind enemy lines to fulfill his various missions, such as evaluating which resistant groups were most effective and providing them aid through the OSS, such as when he was dropped into occupied Norway where he established contact with Norwegian guerrilla fighters. While there, he helped them destroy a German facility that was attempting to build an atomic bomb. Another interesting mission was one where he was trained in nuclear physics in order that he could pose as a Swiss physicist attending a 1944 lecture in Germany. At this lecture, he was to determine if one of Germany’s top physicists was close to being able to create a nuclear bomb. If so, he had instructions to kill him, which turned out not to be necessary. Berg was eventually offered the Presidential Medal of Freedom, but declined it, because he was forbidden to talk about what he had done to earn the award in the first place. Berg’s baseball card is currently on display at the CIA headquarters. The OSS also helped train and supply arms to resistance movements, such as Mao Zedong’s Red Army in China, as well as numerous other groups in areas around or occupied by Axis powers. The U.S.’s original code breaking group within the State Department, MI-8, was shut down in 1929 by the Secretary of State, Henry Stimson, as he felt it was inappropriate behavior for the U.S. to “read other people’s mail”. Child’s kitchen on her TV shows, which is currently displayed at the National Museum of American History, was designed by none other than her husband, Paul. Child’s first professional cooking endeavor was in collaborating with Simca Beck and Louisette Bertholle to write a French cookbook for Americans. The book took ten years to make and was rejected several times by various publishers, before being picked up. The book was: Mastering the Art of French Cooking. Aside from being a cook, Child is said to have loved hiking; hunting; and playing sports, including golf, tennis, and basketball. Child’s show The French Chef was the first show to captioned for deaf people. Child spent as much as 19 hours preparing for each half hour show. Julia Child died two days before her 92 birthday of kidney failure.